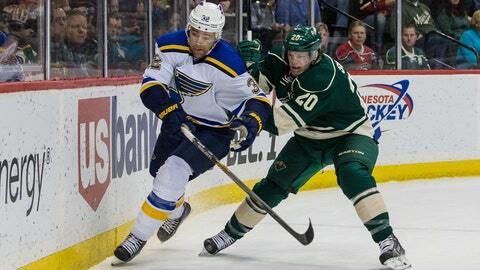 After battling defenseman Ryan Suter, right, Chris Porter can now call him a teammate. The Minnesota Wild didn’t just claim a player off waivers on Thursday – they acquired one of Zach Parise’s best friends. The Wild picked up Chris Porter one day removed from the 31-year-old forward being waived by the Philadelphia Flyers. Parise served as the best man in Porter’s wedding, while the latter returned the favor by being a groomsman on the Wild forward’s big day, according to Michael Russo of the Minneapolis Star Tribune. The two have been linked early on as they both played at Shattuck St. Mary’s and the University of North Dakota. Parise and Porter reunited. Best friends. Porter collected one goal and one assist in 24 games last season with the St. Louis Blues. The 6-foot-1, 206-pound Toronto native has recorded 11 tallies and 16 assists in parts of six campaigns with the Blues.